Landlord Angelo Sangiacomo died 18 months ago at age 91, but his irrepressible spirit — and idiosyncratic aesthetic sensibility — is about to spring to life in the 1-acre plaza opening to the public Thursday at Eighth and Mission streets. His personal point of view shapes every aspect of the courtyard at Trinity Place, the large apartment and retail development he didn’t live to see finished. It’s in the eight blocks of marble scattered about the plaza, each revealing a portion of a figure — braided hair, flowing robes, an angelic visage — you might see in a piazza in Genoa, Italy, from which Sangiacomo’s parents emigrated. As the 70-foot hole for the garage was dug out, Sangiacomo began to think of it as a quarry and he wanted the stone pieces at street level to feel as if they had been dug from the earth and carved right there. It’s in the 25-foot-long marble communal table with a top carved to resemble a bunched-up tablecloth. It’s in the 6-ton illuminated glass bollards containing Romanesque statues that mark the northern entrance. And, most striking of all, it’s hard to imagine another developer with the audacity to commission a 92-foot-tall stainless steel modernist statue of “Venus di Milo” as the centerpiece of a public space. On Thursday, Trinity Properties will celebrate the opening of Piazza Angelo, a privately owned public square that is the centerpiece of a 1,900-unit, four-building complex the family-owned company has been building for the past nine years. 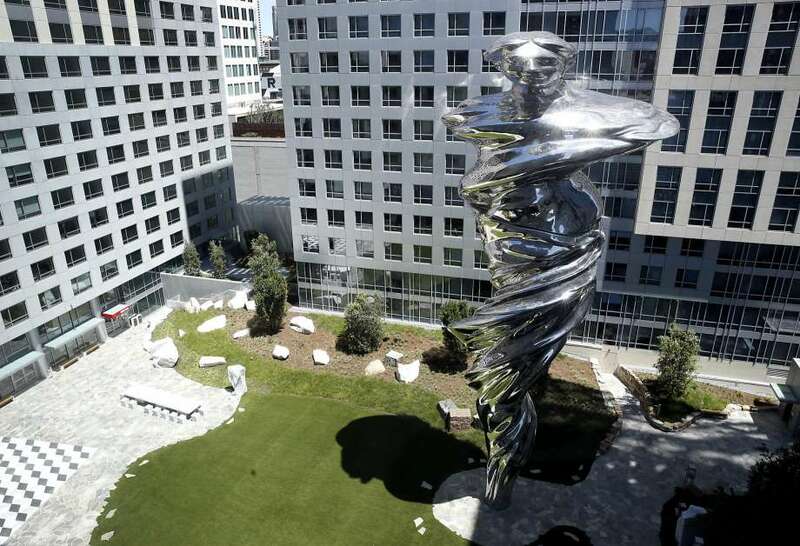 Frankie Avalon will be on hand to sing his classic song, “Venus.” Lawrence Argent, the artist who designed the more than a dozen sculptures that dot the plaza, including “Venus,” will offer a tour of the space that Sangiacomo dubbed “C’era Una Volta” — “Once Upon a Time” in Italian. Above: Artist Lawrence Argent’s 92-foot-high stainless steel sculpture “Venus” dominates the central courtyard at Trinity Place. Below: Carved marble images of Yvonne and Angelo Sangiacomo. Trinity Place, which replaced the old Del Webb Townhouse Motel, has been under construction since 2008. So far, it consists of 1,398 units in three buildings, two on Mission Street and one on Eighth Street. Trinity Properties plans to start construction on the final 503-unit tower this fall. The fourth building, which will front onto Market Street, will include about 85,000 square feet of retail, including a grocery store. In the world of San Francisco development, Sangiacomo was an eccentric. He didn’t pay much attention to market data or what the competition was doing and felt you couldn’t lose money building housing in the city. He didn’t cozy up to politicians, and prior to the 1979 establishment of rent control he was a frequent target of tenants organizations for raising rents, an adversarial relationship that persisted until 2003, when he agreed to include 360 permanently rent-controlled units in the first phase of Trinity Place. While most local development is built by publicly traded real estate investment trusts or financed by public pension funds, Sangiacomo self-financed most of his projects. And he never sold anything. Trinity has never disclosed how many units it owns in the city but it’s likely in the many thousands. He broke ground on the first phase of Trinity Place in 2008, just before the financial crisis. When the markets melted down and development froze, he kept building. The first 440-unit building, at 1180 Mission St., opened in 2010, the only major building to open that year. Phase two, 418 units, opened in July 2013. The third phase, 540 apartments and a 960-car garage, is the biggest. The garage required the contractor to dig down 70 feet and shore up the two existing buildings on Mission Street. It opened in March, and about 30 percent of the units have been rented. Rents range from $2,550 to $4,500, according to rental housing websites. Sangiacomo was a tactile person — he often said that he couldn’t read plans and had his construction crews build mock-ups and models of everything. He hated bathtubs and insisted that his units not have them, but he loved large showers and walk-in closets. Before he died, he spent years working with Argent on the details of the plaza. The two traveled to Italy together, where they selected blocks of marble at Studio Franco Cervietti in the Lucca province in northern Tuscany. The vision for the plaza grew. Argent spent months looking all over world — Europe, Canada, Mexico, the United States — for someone to create the glass bollards. Eventually, he found a Chinese manufacturer specializing in bulletproof glass willing to take a chance. The green glass bollards, which will be lit at night, magnify the statues within. At first the plaza will be open every day from 8 a.m. to 6 p.m. Docents will offer tours of the artwork. Plans for a beer garden and restaurant are in the works. For now the one retailer ready to benefit from the plaza is Focaccia, a salad and sandwich spot that opened in 2015 at 1190 Mission St. Owner David Davari expects the plaza will attract a brisk lunch trade.